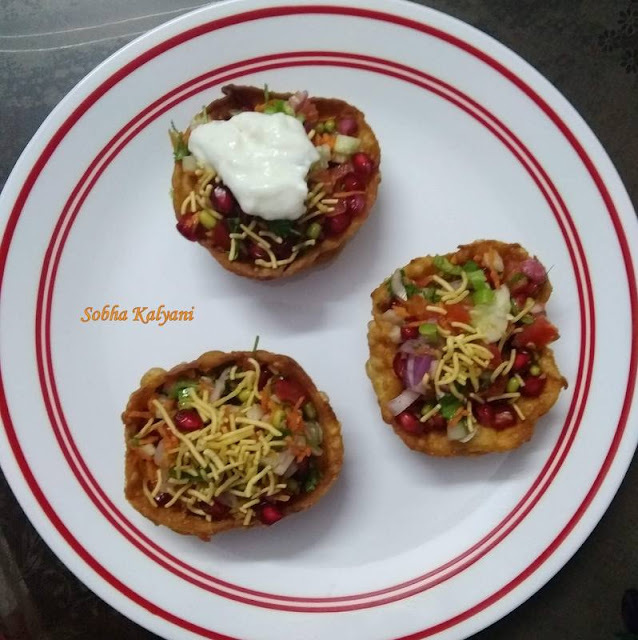 Katori chaat is a unique Indian vegetarian snack item made of a healthy combination of sprouts, fruits, vegetables and curd. The Hindi word 'Katori' means a bowl. Katori chat can be savoured as an evening snack supplemented with a hot cup of chai. It can also be taken as a starter / appetizer. Though making katoris at home is a bit time consuming process, yet it is very easy to make katoris and then fill these with sprouts, chopped veggies and fruits. This healthy, crispy, tasty snack / starter is equally relished by children and adults. Take 3 measures of maida in a bowl and add 1 measure sooji to it. Sooji makes the cups crispy. You can add corn flour instead of sooji. Add salt to taste, ajwain i.e.carom (optional) and 1 teaspoon of edible oil. Blend it well and knead it into a dough adding enough water. Cover the dough and keep it aside for at least 10-15 minutes. 1 measure sprouts as per liking. 1 teaspoon of lemon juice (optional). Teaspoonful of yogurt / curd without cream or tomato ketchup or khatta meetha (sweet and sour) chutney and hara (green) chutney for the chatpata taste. Few dry fruits like raisins (kishmish), cashewnuts (kaaju), almond (badam) and pista for added taste. Adding dry fruits is optional. After 10-15 minutes make small balls of the dough and roll into very thin puris. Take a small steel bowl of desired shape and size and wrap it with the thinly rolled puri. It means keep the thinly rolled puri on the outer side of the bowl and cover from all sides to make katori. Gently trim / cut the part that spreads out. Take a fork and gently prick on the katori to make pricks. By doing so, the katoris won't puff like puris. Meanwhile heat edible oil for deep frying, on medium flame. When the oil is sufficiently heated, turn the stove to simmer and place the katori (i.e. the wrapped steel bowl) gently in the oil. As the katori / cup starts frying deep and turns golden brown in color, the steel bowl slowly gets separated from the katori. Remove the steel bowl and drain off the oil from it, if any. When the katori is done, drain off the oil and place it on a paper towel spread on a plate so that the excess oil, if any, will be absorbed by the paper. 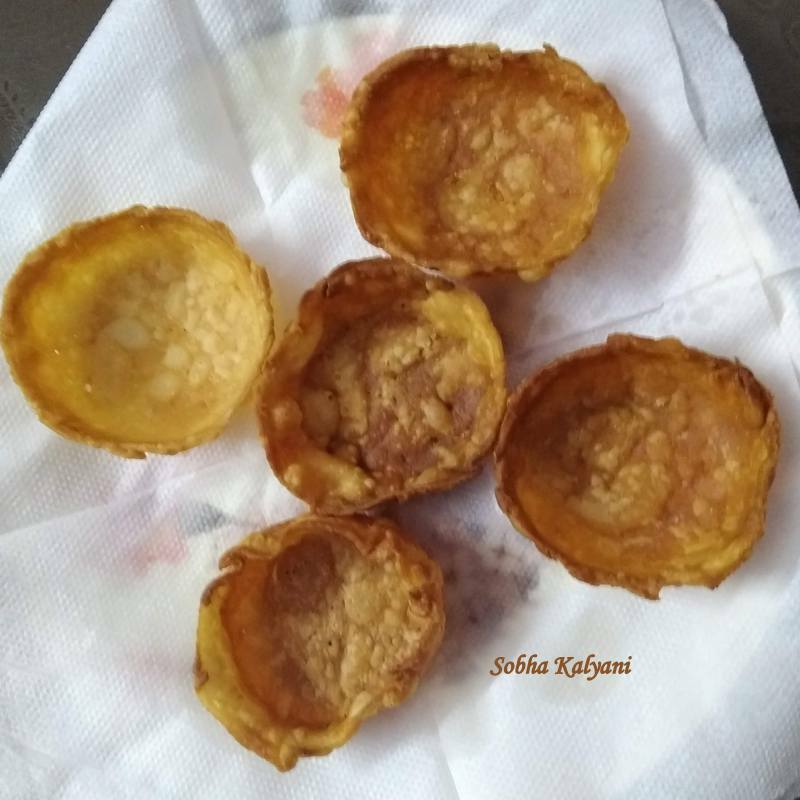 Once the katoris are cooled, fill these with the above ingredients and garnish with yogurt / ketchup / khatta metha chutney / hara chutney and enjoy the home-made katori chaat.